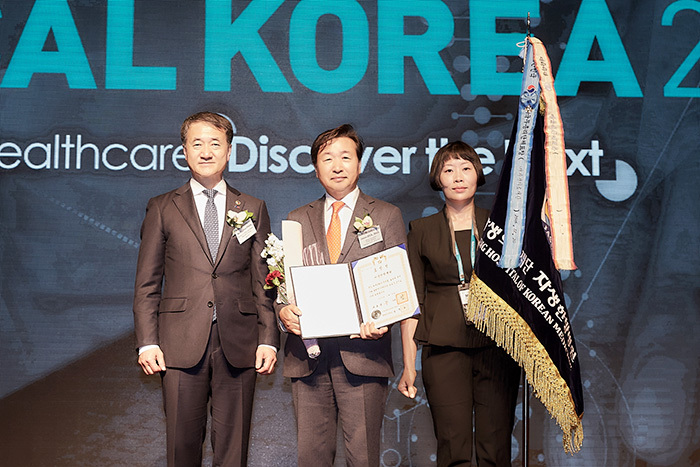 On March 14th, Jaseng Hospital of Korean Medicine (Medical Director, Dr. Jinho Lee) was awarded a Presidential Commendation at ‘Medical Korea 2019’ held at the Grand Intercontinental Seoul Parnas located in Samsung-dong, Seoul. Jaseng Hospital was recognized for its contribution to tourism, attracting a steady flow of foreign patients to Korea and promoting Korean Medicine abroad effectively. ‘Medical Korea,’ hosted by the Korean Ministry of Health and Welfare, annually selects organizations and individuals of merit considered to have made a significant contribution to the development of the nation and society through inducement of foreign patients. At this year’s ceremony, Dr. Joon Shik Shin, founder of Jaseng Hospital of Korean Medicine and honorary chairman of Jaseng Medical Foundation attended the ceremony as representative to accept the prestigious award and honor. Jaseng Hospital of Korean Medicine established Jaseng International Clinic in 2006 to provide treatment for foreign patients. Consisting of medical staff proficient in four languages (English, German, French, and Russian), Jaseng International Clinic facilitates medical consultation and treatment by cutting down the language barrier and thus reducing the need for additional interpretation. In addition, professional coordinators provide all-round comprehensive services for medical care from arrival to departure in Korea in five different languages; English, Japanese, and Russian, as well as Mongolian and Arabic. Through these efforts, Jaseng Hospital of Korean Medicine has been growing at a steady rate of 5% growth annually in inducement of foreign patients. Jaseng Hospital of Korean Medicine has also been working assiduously academically to give lectures on Korean Medicine treatment methods to physicians from countries with advanced medical systems such as the United States, thus effectively promoting the excellence of Korean Medicine overseas. In addition, Dr. Joon Shik Shin, honorary chairman of Jaseng Medical Foundation, has been conducting educational training sessions on Korean Medicine treatment methods for Doctors of Osteopathic Medicine (D.O.s) based in the U.S. as of 2012. Last year, the innovative non-invasive Korean Medicine treatments practiced at Jaseng Hospital of Korean Medicine including Chuna Manual Therapy were officially recognized as a CME course by the American Osteopathic Association (AOA). Incidentally, the Korean Ministry of Health and Welfare has decided to provide national health insurance coverage for Chuna Manual Therapy, and musculoskeletal disorder patients will be able to benefit from national health insurance coverage as of April 2019. Dr. Joon Shik Shin, honorary chairman of Jaseng Medical Foundation commented that “Jaseng Hospital of Korean Medicine treats foreign patients through continuous innovation in provision of patient-centered medical services and care. As we receive patient visits from the world over we strive to help these patients commit to and concentrate on their treatment.” He also spoke of his hopes that Jaseng Hospital of Korean Medicine will continue to expand and broaden its range and boundaries in demonstrating the excellence of Korean Medicine to keep contributing to the continued success of K-Medi. As it has done so far, Jaseng Hospital of Korean Medicine will continue its efforts put to serving and promoting Korean Medicine worldwide.